In a video posted to YouTube late Friday, a part purported to be Apple's "iPhone 6" cover glass was again exposed to a torture test, this time failing to resist scratches from garnet sandpaper, a material softer than sapphire. As seen in the above screenshot, the part supposedly bound for Apple's iPhone 6 shows surface scratches after being rubbed by garnet sandpaper, suggesting the glass is not made of sapphire. 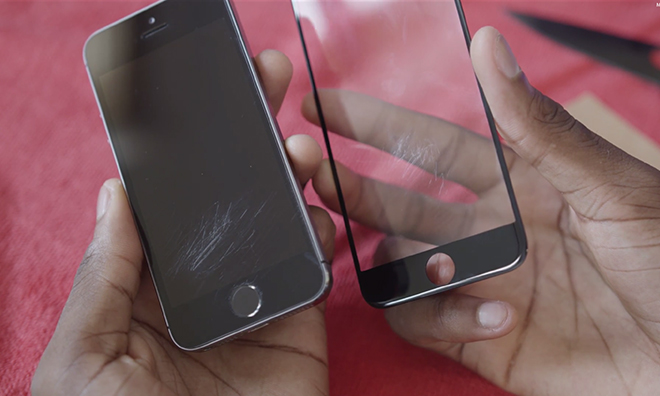 In the video, YouTuber Marques Brownlee also shows the cover glass failing to resist scratches from emery sandpaper, which is much harder than garnet. Brownlee goes on to explain the Mohs scale of relative hardness, noting a material with a higher rating cannot be scratched by one assigned a lower number. For example, sapphire —rated 9 out of 10 on the Mohs scale —cannot be scratched by garnet, which is a 7. Emery is a mixture of corundum and magnetite and is assigned an 8 on the Mohs scale. The only mineral harder than sapphire, itself a form of corundum, is diamond with a relative hardness of 10 on the Mohs scale. Further proving his point, Brownlee takes the same sandpaper to the iPhone 5s, known to sport a screen made from Corning's Gorilla Glass. While the display area is easily scratched, the sapphire-covered Touch ID home button comes out unscathed. With this latest test, it appears the alleged 4.7-inch iPhone 6 part is not made of sapphire as many have speculated, and Brownlee himself stated as fact in a previous video. At this time, the material used to make the cover glass is unknown, though Brownlee proposes Apple has employed a sapphire laminate patent to create a "composite involving sapphire." That specific IP, however, describes a method of fabrication specifically designed to overcome the type of surface scratches seen in the video, while at the same time offering superior flexibility and impact resistance. Another important question to ask is whether the component is even a legitimate Apple part. The answer should come this fall when the company is expected to debut its next-generation iPhone lineup.